What’s the Nature Immersion (Ring 2) Programme? 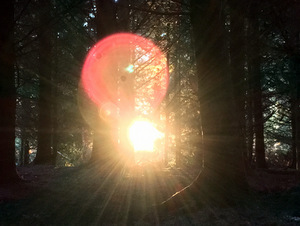 Are you ready for a deep nature connection journey as a returning participant, living and playing in the woods? 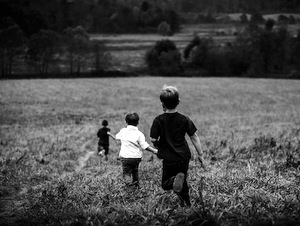 Practice core nature connection routines as a small tribe as we return to the land. Nature Immersion (Ring 2) allows you to deepen your experience of the living world through adventure and play. Falkland Estate in Fife is a treasure trove of old trees, waterfalls and hills; a perfect place to walk on the wild side! Grow your confidence and connect more deeply as you use ancient skills to sustain yourself and your tribe, play in nature and roam in the wild. 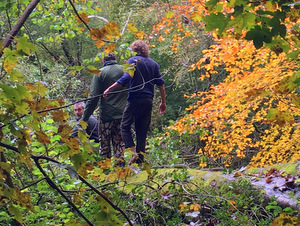 Nature Immersion is a springboard to you getting into nature more often, rewilding yourself and inspiring others to do the same. What Will You Do and Who Will Guide You? 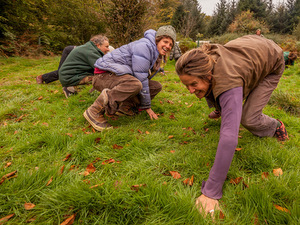 The Nature Immersion programme may raise dormant natural rhythms deep in your bones as you remember how to live in close connection with land and tribe. Immerse yourself in bird language, tracking and ancient crafts with folk who share a kinship with nature. 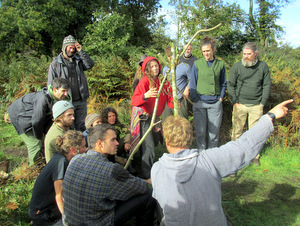 Nature Immersion (Ring 2) has a mostly self-contained programme, re-joining the village for most meals and some key events. You’ll be guided by facilitators with deep and diverse experience in nature connection practices and crafts. Is Nature Immersion (Ring 2) for You? Perhaps you’ve recently rekindled a sense of belonging to place. 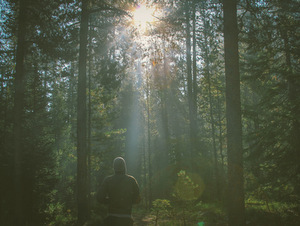 Or maybe you’ve experienced a deep connection to nature for much of your life, as a wonderful but sometimes lonely path. 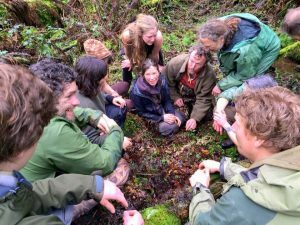 For teachers, mentors, parents, carers, seekers and leaders, the nature immersion programme offers the wild time that is the substrate of stories. Your stories are the vital ingredients for effective mentoring; they inspire enthusiasm and passion which can tip people young and old headlong into a new relationship with the natural world. The Nature Immersion (Ring 2) programme can be workable for parents who have children in the Foxes. You’ll be back at camp for supper most days with the exception of optional overnight(s) away from camp. Please note that most parents on previous camps have found the Nature Immersion programme challenging without dedicated support from an additional adult on the camp able to help them with childcare. Please see advice for family groups for further guidance.